Married Name: As of September 1925,her married name was O'Connor. [S1251] Illinois, Deaths and Stillbirths Index, 1916-1947, online FamilySearch.org, Helen O'Connor, accessed December 30, 2010. [S2355] St. Mary Church, Evanston, Illinois, "St. Mary Church Records," Baptismal entry, Page 34, MF# 1548257, Ellen Frances Connor. [S1251] Illinois, Deaths and Stillbirths Index, 1916-1947, online FamilySearch.org, Helen O'Connor death record, FamilySearch.org, accessed December 10, 2012. [S1933] Illinois, Cook County Birth Certificates, 1871-1940, Index, online www.familysearch.org, Patricia Ruth O'Connor, 1925; Digital folder # 100368750; registered 01 Nov 1925; accessed 25 Jul 2014. [S1251] Illinois, Deaths and Stillbirths Index, 1916-1947, online FamilySearch.org, Helen O'Connor, Vol. and page: Bk 23, p. 10153, cn 172; accessed December 30, 2010. [S1155] James Connor Cemetery Grave Card, Calvary Cemetery, Evanston, Cook County, Illinois, USA. Baptism: She was baptized at Evanston, Cook County, Illinois, on 25 January 1883. Religion: St. Mary's Baptismal Register, page 10. Godparents: James C. Connors and Bridget Connors..
[S171] St. Mary's, Evanston, IL, Church Records, Death. Baptism: He was baptized at St. Mary's Church, Evanston, Cook County, Illinois, USA, on 25 April 1886. Religion: Roman Catholic. St. Mary's Baptismal Register, page 14. Godparents: Michael Bowler and Kate Connors..
[S411] California Death Index, online Ancestry.com, Francis J. Connor, died July 1, 1941, FamilySearch.org accessed April 14, 2016. [S208] Connor/Harris Marriage, Marriage License. [S139] Evanston Review, March 17, 1932, Page 53. Marriage*: He married Margie M. (?) before 1946. [S209] Francis Roger Connor, Birth Certificate # 8370 (June 18, 1941). [S210] Francis Roger Connor, Death Certificate. [S2353] St. Mary Church, Evanston, Illinois, "St. Mary Church Records," Baptismal entry, Page 31, MF# 1548257, Genevieve Bridget Connor. [S2362] St. Mary Church, Evanston, Illinois, "St. Mary Church Record," Baptismal entry, MF# 1548257, Irene Connor. Biography*: In the History of Cook County, Illinois: From the Earliest Period to the Present Time, by A. T. Andreas, Published by A. T. Andreas, Chicago, 1884 additional information about St. Mary's Church is provided. Death*: James died on 2 October 1897 at Evanston, Illinois, USA. One of Evanston's oldest citizens passed quietly and peacefully away last Saturday, dying surrounded by his loving children and grandchildren and at peace with all the world. This was Mr. James Connor, who had reached the good old age of 79 years, and who had been a resident of this city for forty-three years. Mr. Connor was born in County Wexford, Ireland, in 1818, was married and four children were born to him there. He came to this country and located in this city forty-three years ago, his first house being built on what is now Stockham Park, just south of the present residence of Mr. D.H. Burnham. In 1862 he moved to the corner of Ridge avenue and Lake street, where he lived for twenty years. For over thirteen years he has made his home with his son, Thomas E. Connor, at 1217 Oak avenue, and it was there he died. His children, most of them residents of this city and all well known and highly respected here, are J. C. Connor, head of the hardware house of that name and now dead; John A. Connor, of Connor & Mc Cann; Ellen, who married Philip Sullivan of Chicago; Bridget, now dead, who married Frank Hayden, Mary, who married James Haukhey (sic Haughey) of Chicago; Thomas E. Connor of the hardware house of Connor & Arnold. Their children, the grandchildren of James Connor, number fifty-seven. His wife died fourteen years ago and since then he had not engaged in any active occupation, although his health was uniformly good up to a week before his death. He worked for a great many years for Mr. H. B. Hurd, Mr. Bliss and John A. Pearsons, and was always steady, industrious and reliable. His maiden sister, of nearly the same age as Mr. Connor, died in the same house, just five months to a day before him. His first hemorrhage occurred the Sunday previous to his death and he seemd to take it as a warning and was prepared for the end when it came. He took to his bed and remained there, but did not suffer greatly. All his living children were at his bedside to soothe his last moments. The funeral occured Monday at 10 o'clock a.m., at St. Mary's church, Fr. Smyth celebrating solemn high mass, assisted by Fathers Conway and Burke. Father Smyth in his remarks on Mr. Connor's life said: "I may speak of his honesty, the straightforward manner of his dealing with all men. None ever knew him to be underhanded in what he did or to be other than kindly. He was broad in his charity. He included every one in his benevolence. He always thought kindly and spoke kindly of all he knew well or met as acquaintances. His friends were many. Every man, woman and child who knew him knew they had a friend in him. His long devotion and loyalty to this church and his people here will not be forgotten soon." The cortege which followed the remains to Calvary cemetery was one of the largest ever seen in this city, and the floral offerings from relatives and friends were very beautiful as well as numerous, and testified the high regard in which Mr. Connor was held. Death Notice: James Connor, one of the pioneer residents of Evanston, died yesterday afternoon of old age at the home of his son, J. A. Connor, 1217 Oak avenue. He was 80 years old. Mr. Connor was born in Ireland. He came to America in his youth and since 1852 lived in Evanston. He leaves two sons, John A. Connor and Thomas E. Connor. Funeral services will be held Monday morning at 10 o'clock from St. Mary's Roman Catholic Church. Father Smyth will say requiem high mass. [S164] Evanton Review, October 9, 1897. [S654] Chicago Tribune, October 3, 1897, Historical Newspapers Chicago Tribune, p. 3. [S1683] James C. Connor, U. S. Passport Applications, no. 24660 (February 15, 1889). [S126] Evanston Press Co., Evanston Directory, Page 85. [S127] Evanston Press Co., Evanston City Directory, Page 76. [S171] St. Mary's, Evanston, IL, Church Records, Death , James Connor entry, October 2, 1897. Emigration: He emigrated in 1855 from Ireland; See Katherine Connor's obituary, May 8, 1897. Marriage*: He married Hannah Doyle at Evanston, Cook County, Illinois, on 5 April 1875. Witnesses: John Doyle and Bridget Connors and others. Biography*: Evanston - A Pictorial History, by Barbara J. Buchbinder-Green, 1989 Page 72. "Born in Wexford, Ireland, James Charles Connor (1846-1890) came to Ridgeville with his parents in 1854. He learned the building trade with Miles Russell and John Wesley and built several houses around town. In 1879 he became a partner in Wightman & Connor, the successor hardware company to Wightman & Reynolds. Addison Porter Wightman (1818-1890) had arrived in Evanston in 1866 and started the hardware business with his brother under the name of R. V. Wrightman & Brother. In 1883 Connor bought out the interests of A. P. Wrightman, who then went into business with Alexander Drummond. Connor's store, shown on the left, stood at 618 Davis Street, east of Sherman Avenue. He advertised that he was a 'Dealer in Hardware and Furnaces, Stoves, Tinware and House Furnishing Goods, Roofing and Guttering, Prompt Attention given to Jobbing, also Building and Contracting, Carpenter Work of Every Description Promptly Attended To.' After having the little frame building moved, Connor had a handsome new structure built at 618-20 Davis Street in 1886 (shown below). Designed by Edbrooke and Burnham, it had an Anderson pressed brick front. Connor's occupied the eastern storefront and Edward W. Learned's grocery, the western. In December 1929 the Connor Building was destroyed by a fire that burned out John R. Thompson's Restaurant and Dubreuil's Tea Room. However, the little frame store in which Connor started still stands at 2002 Maple Avenue; it is now the home of Evanston Photographic Studios. "Connor, James C., hardware dealer, was born in Co. Wexford on April 6, 1846. When six years of age, his parents, James and Anastasia, came to Evanston, IL and were among the early settlers. He was one of six children. In 1869 he bought real estate and commenced building houses on it, selling the same and continuing such, with contracting up to 1879, when he bought out the interest of Samuel Reynolds, of the firm of Wrightman & Connor. In 1876 he was one of the Trustees of the Village of Evanston. He married Hannah Doyle of Chicago on February 1, 1875 and they had four children: Charles J., Willie, Mary L., and Annie B. History of Cook County, Illinois, by Alfred T. Andreas, Chicago, 1884"
History of Early Chicago; Modern Chicago and its Settlement; Early Chicago, and the Northwest by Albert D. Hager, pg. 442. Only the prompt and efficient work of Evanston firemen under command of Chief A. N. Hofstetter, in which virtually every piece of Evanstonia firefighting equipment was called into play, prevented the blaze from spreading to adjacent buildings. The efforts of the firemen were greatly handicapped by the freezing temperature, which quickly turned water to ice and endangered their tasks. The blaze, which was discovered by Herman Eppers, night manager at the Thompson restaurant, had filled most of the building with dense smoke before firemen arrived. The basement under Du Breuil's tearoom, where the fire is believed to have originated, was a roaring furnace when the first hose line was laid. It was the inability of firemen to approach the heart of the fire which gave the flames sufficient headway to destroy the entire building. For two hours firemen sought to check the flames, and at four o'clock, just as it seemed the situation was under control, the fire shot through the roof of the two-story brick structure, one of the oldest building in the downtown section, and all hope of saving it was abandoned. Besides the restaurant and tearoom, the building was occupied on the second floor by the Evanston Letter service, MacNaughtan and Appleyard electrical fixture shop, and the Bateman Construction company's offices. Although preliminary estimates place the damage at about $100,000 for equipment and $50,000 for the building, the total loss may reach $200,000, due to the smoke and water damage to several adjoining shops. A light breeze from the west aided the firemen in saving from damage the building adjoining the Connor building on the west, occupied on the street floor by the Evanston Brunswick music store and the Mitzie Dress shop, and on the second and third floor by the family of L. J. DuBreuil and a rooming house conducted by Miss Maude Maynard. This building was separated from the burning structure by a single brick wall. The occupants of the rooming house were driven to the street by the intense heat. The Brunswick and Mitzi shops, as well as Kreage's store at 624 1/2 Davis st., Chandler's at 630, and Walgreen's at 634 reported smoke and water damage. The basements of these shops were inundated with water which damaged valuable stocks. Mr. DuBreuil had just closed his tearoom for the night and was at home when Mr. Eppers informed him of the fire. He attempted to enter the place to save his records and money, but was prevented by the heavy smoke. Later, however, the smoke cleared and he rescued the records as well as the day's receipts of money. A few persons were present in Thompson's when the alarm was first given. Despite the smoke they remained in the place for a few minutes watching the work of firemen. A temperature of ten degrees above zero kept the crowd of curious to a few persons until daylight when Evanstonians on their way to work passed to look on. This morning's fire is the most serious in Evanston since January 9, 1927 when the old Boltwood school at Dempster street and Elmwood avenue was destroyed by flames with a loss of nearly $200,000. The Connor building was erected about 40 years ago by J. C. Connor, now dead, and was one of the last buildings of that age that has survived the march of progress. Three years ago the building was sold by Mrs. Hannah Connor, 1220 Maple ave., widow of the builder, and her son, C. J. Connor, a real estate operator, to Northwestern university, the present owners. A short time later it was leased for twenty-five years, to the John C. Thompson company, owner of a chain of restaurants. The building was remodeled in 1927, when the Thompson restaurant was opened. DuBreuil's tearoom, known as a rendezvous for students of Northwestern university, was opened eight years ago. Mr. DuBreuil's lease was about to expire, but had been extended to April 1, with privilege of renewal at that time, he said. Mr. DuBreuil was uncertain this morning as to his future plans. His loss, he said, was partially covered by insurance, as was the case with other occupants of the building. It is extremely improbably that any attempt will be made to rebuild the structure, since only the walls remain, with the exception of a small portion on the street front. Several times during the progress of the fire, which was brought under control about 5:30 o'clock, the Simpson building, immediately across the alley from the burning structure, was threatened by the flames, but was saved by the efforts of Chief Hofstetter and his men. In spite of the heavy coatings of ice which covered ladders, the roofs of adjoining buildings, and other bases of operations, not one fireman was injured. Some of the men were nearly overcome, however, in their attempts to enter the smoke-filled shops. When they returned to quarters late this morning many of the men were so coated with ice that their frozen clothing could be removed only with difficulty. Location of source and date copied: Evanston Public Library, Evanston, Illinois September 21, 2002. Employment*: He was employed circa 1883 at 618 Davis Street, Evanston, Cook County, Illinois, USA. Biography: "JAMES C. CONNOR, hardware dealer, was born in the county of Wexford, Ireland, April 6, 1846. When eight years of age his parents, James and Anastasia, came to Evanston and were among the early settlers. His father carried on farming, but is now living retired. The subject of this sketch was one of six children. He learned his trade with Miles Russell and finished with John Wesley. In 1869 he bought real estate and commenced building houses upon it, selling the same and continuing such, with contracting, up to 1879, when he bought out the interest of Samuel Reynolds, of the firm of Wightman and Reynolds, hardware dealers, when the firm became Wrightman & Connor. In 1883 Mr. Connor bought out Mr. Wightman and has carried on the business to the present time. In 1876 he was one of the Trustees of the village of Evanston. He married Miss Hannah Doyle, of Chicago, February 1, 1875. They have four children -- Charles J., Willie T., Mary I., and Annie B." Biography: "In 1889 Mr. McCann, accompanied by Mr. James C. Connor, enjoyed a European trip, visiting the Mediterranean, Rome, Naples, Alexandria and Cairo, passing through the Suez canal to the Holy Land, where they spent some time visiting the principal historical spots. They were with a party of tourists known as the First American Catholic Pilgrimage, and were gone six months. On his return he visited his native land, passing also through England and Scotland." In the name of God Amen. I James C. Connor of the Village of Evanston in the County of Cook and State of Illinois of the age of forty-two years do make, publish and declare this my last will and testament. I being at the time of the making thereof of sound mind and memory, first I give and bequeath to my wife, Hannah Connor all the property of every kind, nature and description of which I shall die siezed, the above including all the real estate, personal property choses in action. LIfe insurance and everything I have at the time of my death to be and remain hers in fee simple absolutely and forever. Second I hereby appoint Hannah Conner [sic] my said wife, sole executrix of this my last will and testament, and request that no bond shall be required or demanded of her from any court as such executrix, or, for the carrying out of the provisions of this my will. In wittness whereof I have here unto let my hand and seal this 15th day of February in the year of our Lord Eighteen Hundred and eight nine (1889). Will proved and admitted to record in open court this 2nd day of December A. D. 1890. Biography: Left for Europe and the Holy Land with a large congregation of 100 pilgrims led by the Very Rev. Charles A. Vissani, O.S.F. They plan to visit Rome and the Holy Land including Egypt and Jerusalem. 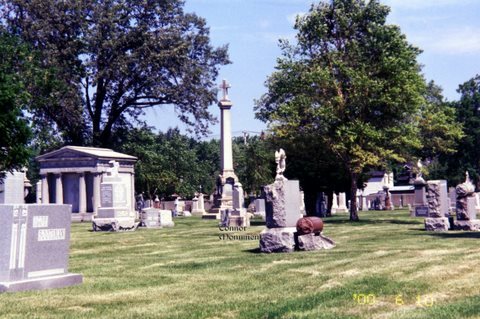 Death*: James died on 25 November 1890 at Evanston, Cook County, Illinois, at age 44. Obituary 1: Funeral of J. C. Connor. The funeral of J. C. Connor took place yesterday at Evanston. The body was taken from the residence at Maple and Dempster streets to St. Mary's Catholic church, where high mass was said by the pastor, th Rev. Daniel Donahoe, and a sermon was delivered by the Rev. P. C. Conway. The funeral then proceeded by carriages to Calvary, where the body was laid to rest. The following gentlemen acted as pallbearers: D. McCann, Frank Headen, Frank McCauley, George Shaw, William Doyle, and Michael Foley. Several church societies attended in a body,as did the Business Men's Association. The deceased was a well-known resident of Evanston. He was a contractor and builder, and through diligence and strick attendance to business amassed quite a fortune. He leaves a wife and seven children. The Daily Inter Ocean, Chicago, Illinois, November 28, 1890, page 2. Obituary 2: James C. Connor. Mr. James C. Connor, a prominent citizen of Evanston, died yesterday morning at 1:39 o'clock at his home, No. 123 Maple avenue. He has been sick since August with what was at first pronounced partial paralysis, but which turned out to be ulcer of the brain. Mr. Connor came to Evanston with his parents from Ireland about thirty-five years ago, and has resided there ever since. He was a contractor and builder, and built many of the beautiful residences in Evanston. He was also proprietor of a large hardware store, and owned some of the largest business blocks in town. He was a prominent member of the Catholic church, and took a trip to the Holy Land a short time ago. He leaves a wife and seven children, the oldest of whom is 15 years of age. He has two brothers, Thomas E., and John A. Connor, living in Evanston, and two sisters, Mrs. Phillip Sullivan and Mrs. James H. Haughey, living in Chicago. Probate: His estate was probated on 7 March 1893 at Cook, Illinois, U.S.A.; Copies of probate records in Elaine Beaudoin's file. Shortly before 11 o'clock the occupants of the upper floor of the Connor building on Davis street, discovered a fire in the Odd -Fellows Hall. Access to the hall was prevented by the dense volume of smoke, which soon poured through the roof. For some time there was difficulty in getting water, but after the arrival of the department there was an abundant supply. As we go to press the firemen are still at work. It is believed that the chief damage will be with water, although there is still danger that the fire may burn through and injure the building materially. As was anticipated last Saturday when The Index went to press, the fire in the Connor block was extinguished before the building was materially damaged. Mr. Connor estimates his loss at $5000 on the building and $2000 on the stock, the latter being by water. E.W. Learned also suffers to some extent by water. The damage to the furniture and fittings of the Odd-Fellows Hall is estimated at $2200. All this is covered by insurance, but as usual there is considerable difference of opinion between the adjusters and the owners as to the amount of the loss. [S584] Mary Lucy Connor, Illinois birth certificate no. 1115, Family History Library, MF# 1287767 (no date). [S2300] Taghmon Parish, Microfilm 04247/09; Page 51, James Connor baptismal record: Catholic Parish Registers at National LIbrary of Ireland online, accessed March 25, 2016, Baptisms July 11, 1832 - December 21, 1865, Taghmon Parish. [S1164] Unknown author, Industrial Chicago. [S2281] James Charles Connor, U.S. Passport Applications, no. 24660 (Issued February 18, 1889). [S2276] Record of Wills Book 12, 1890-1891: Acessed December, 2015; Ancestry.com. [S1682] New York Times, February 17, 1889. [S920] The Daily Inter Ocean, November 28, 1890, page 2, issue 248, column C, infotract.galegroup.com, accessed April 27, 2009. [S146] James C. Connor Cemetery Grave Card, Calvary Cemetery, Evanston, Cook County, Illinois, USA. [S921] Inter Ocean, November 26, 1890, www.genealogybank.com, accessed May 9, 2009. [S279] Evanston Review, April 21 and 28, 1888, pages 1-2, December 2, 1929, pages 1-2. Residence*: He resided at Evanston, Cook County, Illinois, USA, in 1929, at 2707 Broadway. 1929 Evanston Directory. States that he was a salesman for Thomas E. Connor (this was his father)..
James C. Connor, 63 of 1110 Lake street died Saturday in Hines Veterans Hospital after an illness of several months. He had been employed by Chandler's store in the stationery department for the past 12 years. Born in Evanston, Mr. Connor lived here all his life. He formerly worked for the Stebbins Hardware Company, Chicago. His father, the late Thomas E. Connor, was a pioneer Evanston hardware merchant. He is survived by two daughters, Mrs. R. A. Hendricks and Mrs. Ralph Fortune, both of Washington, D. C., three sisters, Mrs. Neil Benedict of the Lake street adress; Mrs. D.J. Harrigan, 1217 Oak avenue, and Mrs. John J. Gaudino, Los Angeles, Cal; a brother Thomas J., 1123 Noyes street and 11 grandchildren. Three sisters, all former Evanstonians, preceded him in death. They were Mrs. E. J. O'Laughlin, Mrs. Frank O'Connor and Miss Elizabeth Connor. Prayer services in the Fitzgerald and Karsten chapel were followed by a requiem high mass in St. Mary's Church. Burial was in Calvary Cemetery. [S107] James Colbert Connor, Baptismal Record. [S2357] St. Mary Church, Evanston, Illinois, "St. Mary Church Record," Baptismal entry, Page 38, MF# 1548257, James Colbert Connor. An inoculation against scarlet fever resulted in a shock which caused the death of James Connor, 7-year old son of Mr. and Mrs. T. J. Connor, 1122 Oak avenue, manager of the Connor hardware store, Thursday. Five-year old Mary Connor, sister, was under quarantine for scarlet fever at the time. The family physician as a precautionary measure, inoculated two brothers with a preventive serum, and the death of James followed within three minutes. The other brother, Thomas, a nine-year old youngster, suffered no ill effects. A coroner's jury found the death was due to shock from anaphylaxis serum used as an antitoxim for scarlet fever. Funeral services were at St. Mary's church Saturday with burial at Calvary cemetery. [S156] Evanston Review, November 17, 1927, Page 78. [S1413] Bureau of Vital Statistics entry, Cook County birth registration, Ancestry.com, accessed October 26, 2011, James Deal Connor birth record, FHL#1308626. [S156] Evanston Review, November 17, 1927. [S205] James Connor, Death Certificate, 1927. [S655] Chicago Daily Tribune, November 11, 1927, p. 1.